Completely upgraded custom home on a 1 acre lot. 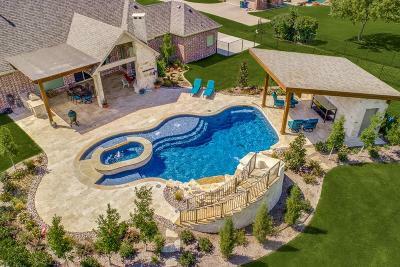 Resort style 40, 000 gallon pool, travertine decking, slide, hot tub, out door kitchen, cabana with restroom and storage. New level 5 granite, new tile and paint in the kitchen. New HVAC, tankless water heater, additional attic insulation, new carpet and wood flooring. Wrought iron fence with backyard irrigation. Outdoor fireplace with Lynx grill, Control 4 Sonos speaker system, LED lighting in backyard and around the pool. Septic was upgraded from aerobic to a drip system. All remodeling was completed within the lat 2 years, like a new custom home. 4 bedrooms, game room and office.